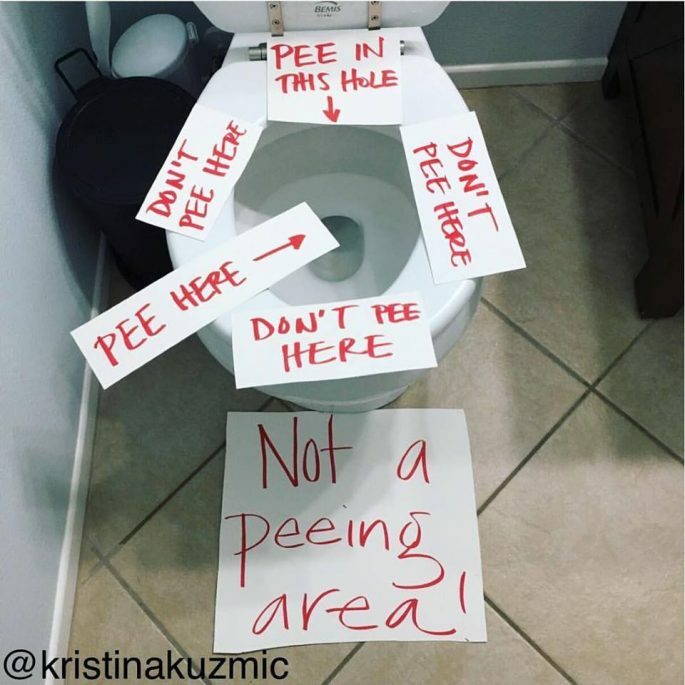 Let’s be real and say that men don’t always have the best aim, and if you have young boys in the house, you know that it starts at a very young age. It’s not a hard concept to grasp, but yet the battle still rages on, a battle that mom of three Kristina Kuzmic is all too familiar with. Getting a little bit cocky in comparing yourself to a garden hose there, aren’t we, Tom? But certainly an interesting visual. I have to agree with him here, in a way. When it comes to public bathrooms, I feel likeinconsiderate evacuation of one’s bladder doesn’t discriminate between the sexes. I’m not really sure how aesthetically pleasing a urinal would be in a bathroom, especially when he mentioned it would be easy to sit down, but what do I know? If I sprinkle when I tinkle, I try to be neat and wipe the seat.